"Devon joinery specialists offer a range of services, from bespoke design and fabrication, to installation and construction"
A range of local joiners working across the wider East and South Devon areas are on hand to create bespoke products to suit your family's needs. Professional joiners are used to cutting and fitting joints in wood that do not use nails but rather use traditional joints such as mortice and tenon. 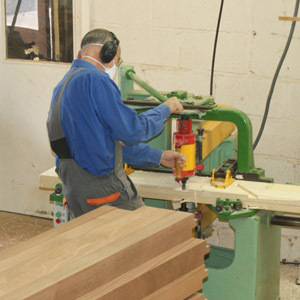 All work carried out by experienced Devon woodwork specialists is done so within fully equipped workshops. Here, they combine traditional craftmanship techniques with the most cutting edge technology in order to create stunning bespoke items. Unlike carpenters who normally work on site, joiners complete projects within their own workshops and are well known for their attention to detail and fine craftsmanship. Woodwork experts offer a large variety of services which can be bespoke to your exact needs, whatever they may be. Whether it is a bespoke conservatory you are after, a new wooden window project or you are in need of new interior or exterior wooden doors, a joiner will be able to give you a variety of options to choose from. With a wealth of different woods, cuts and finishes available engaging an experienced joiner for your upcoming project need not be a headache. A range of local joiners working across the Devon region with many years' experience in the industry, are on hand at every step of the way to provide a truly personal and bespoke finished product. By working collaboratively with a knowledgeable joiner you can rest assured you will receive a bespoke piece which meets your exact specification and design brief. Joinery specialists usually work offering a design, planning and installation service alongside so that they can help carry out a project from beginning to end with any job you have in mind. 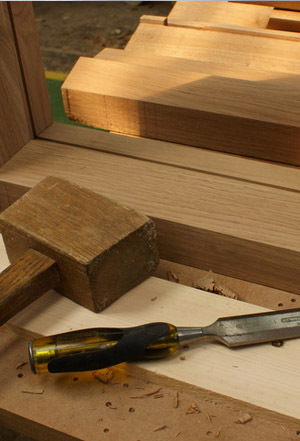 Joiners are master craftsmen and are passionate about the work that they do, whether its a small bespoke piece of work or an architectural piece of installation, each piece will have a unique and distinct character finish. The majority of joiners in Devon offer a design and build service for individual needs which can include: windows, doors, staircases, gates, wardrobes, bookcases, shelving, cabinets, tables and chairs to be made in any type of timber. "Joiners are master craftsmen and are passionate about the work that they do, whatever the size of the project"
Pieces of furniture can also be made for free standing or fitted areas and can be made to measure and fit perfectly with your home, whatever space you have within your home. Traditional wood joinery often use techniques that create distinctive material properties of wood, without the use of modern techniques which often resort to mechanical fasteners or adhesives. If you are wanting to create a bespoke piece for your home be it a wooden staircase, bespoke interior or exterior doors, timber sash windows, timber gates or a bespoke conservatory, a range of Devon joiners are on hand to help transform your dreams into a reality. Find a local Devon joiner in your area by clicking here.